Kelly Williams Brown is the founder of the popular Tumblr, AdultingBlog.com, and she is, in fact, sometimes, an adult. Previously, she was a features reporter and an award-winning humor columnist for the Statesman Journal, a daily newspaper in Salem, Oregon. These are the steps I wish I'd had before I grew up. Wait-What am I talking about? These are steps I will start using today! Kelly Williams Brown writes as charmingly and hysterically as she does helpfully. Get this book and grow up! Twentysomethings who are looking for a silver bullet will find it here in the form of 468 silver pellets. Without a doubt, one (or a hundred) of these pellets will change your relationship or your career or your mind or your potatoes, all of which matter in adulthood. Kelly Williams Brown is my kind of twentysomething. Kelly Williams Brown is wise beyond her years, which is great news for those of us who are immature beyond ours. Her advice is brilliant, warm, funny, and USEFUL, much like the lady who wrote it. I'd love to have her over for tea but I don't want her to see my apartment. "Fun, chatty, and surprisingly informative.... perfect for the wayward 20-something, or 30-something, or..."
"This hilarious and super-relatable how-to guide for acting like an adult ... is full of aha moments." Kelly Williams Brown, author of "Adulting," is the voice of her generation. Unfortunately, that voice is telling her she should make a soufflé and take her LSATs. She shouldn't listen to the voice, and neither should you. Kelly Williams Brown should be writing: period. Anything else is just robbery. 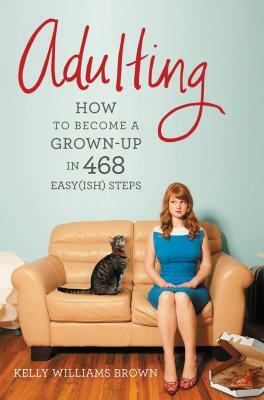 "Adulting" is hilarious and filled with keen insight, a terrific dance down the road of everyday insecurity. Adulting is a must-read for anyone in their twenties! Author Kelly Williams Brown has penned an incredibly helpful how-to geared toward twenty-somethings who may be grown up but don't always feel like it. ... Adulting is incredibly funny and a pure joy to read.